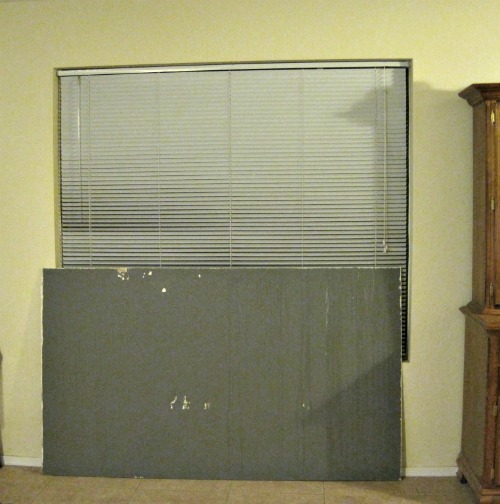 I’m about to show you something I’m completely ashamed of…the reason I haven’t posted any pictures of the living room…. 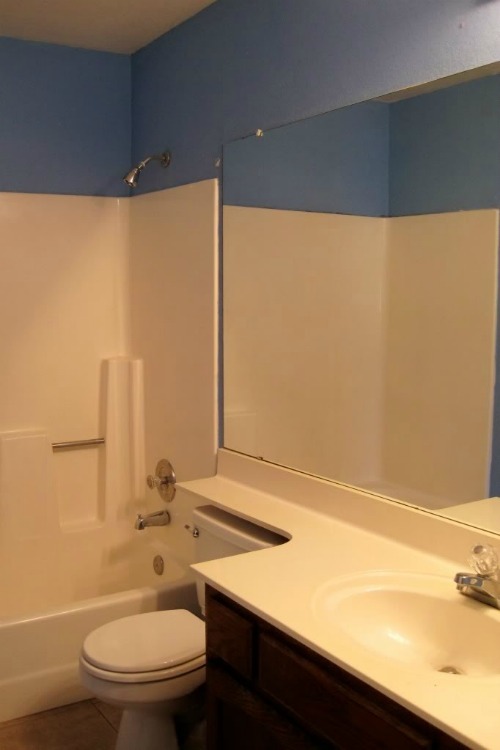 Remember this mirror? The one I ripped off the bathroom wall 10 months ago? Yeah, so it’s been sitting in my living room ever since then. I left it there because it’s really heavy and that’s about as far as I could move it. I figured I’d put it on Craigslist for free and it’d be gone in a few days. 10 months later…I still hadn’t listed it on Craigslist and it was just sitting there mocking me for being a procrastinator. Before I tell the rest of my mirror tale, I realize I could have just listed it on Craigslist and been done with it. But I didn’t, mostly because I hate dealing with people from Craigslist and I hate giving strangers my address…especially if I’m not making any money. Yes, I’m paranoid and selfish. Anyway, one night last week I snapped. I said to myself, “Screw 7 years bad luck! I’m going to break this thing and throw it away. 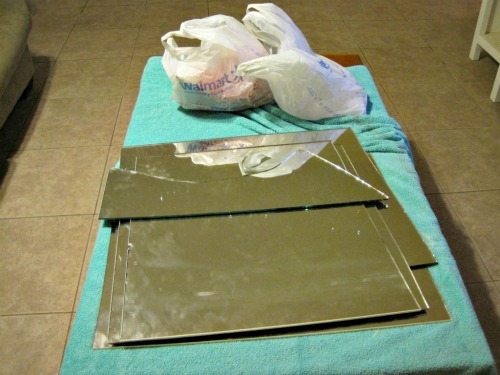 It’s probably bad luck to have a mirror blocking a window for this long!” Then I realized that there’s no way to break that big of a mirror without making a huge mess – scratch that plan. That piece was hanging too far off the table, so it fell when I cut it. 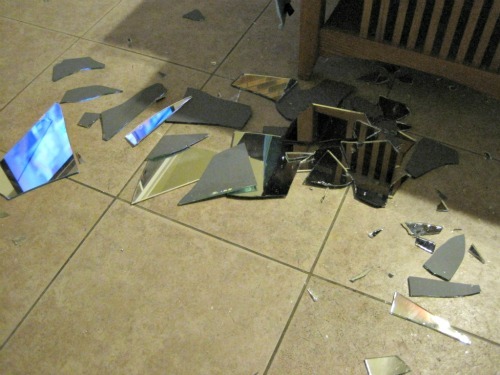 Ugh, it took forever to clean up – good thing I didn’t go with my original plan of breaking the whole mirror. Fast forward a couple days: my hand is healing, the mirror is safely in the trash can, and I’m ready to hang some curtains! I saw these curtains at Target about a week ago and almost bought them, but I’m indecisive about anything fabric related so I didn’t. Then I saw them again at Inside-Out Design and decided I did want them. Did you know Target has Target specific coupons? They do and they happened to have a Buy One Get One ½ Off coupon for any Target Home curtains! So, instead of paying $19.99 for each panel, I got both panels for $30! $10 savings – I’ll take it! Is it just me or is it impossible to get a good picture of a window?! Especially the biggest one with the most light! The curtain rod is from Wal-Mart. I wish I could hang it a little higher, but then my curtains would be high-waters. 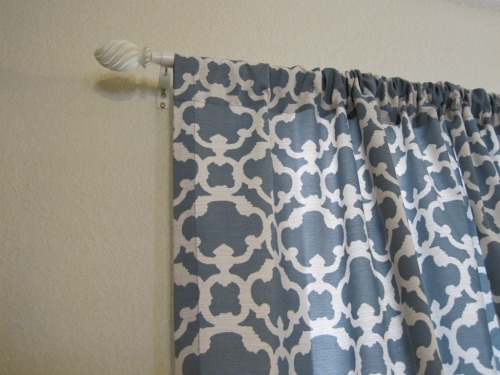 Maybe someday I’ll add trim to the bottom of the curtains and re-hang them…don’t hold your breath though. Whew, that was a pretty long post just to tell y’all that I hung curtains! Yay for the curtains, sorry about the cut hand. Yup, I'm like that too, to have something sit there forever because I have plans for it...that never get done. I soo know what you mean about Craigslist. I've been listing stuff on there and it's soo much fun....NOT. If people are interested I have them text me before I give them my address, but then 30 min before they are due to arrive they cancel. Ugh!!! That has happened three times to me in the last two weeks. What. A. Pain. Oh dear - sounds like my kind of disaster. I put a bottle of Becks Blue in the freezer last night to cool down, forgot about it and then found broken glass everywhere this morning (and frozen beer slush) Obviously it froze solid cos it was alcohol free - oops! Oh man, bummer about your hand. I think the bad feng shui of the mirror blocking your window cancels out the broken pieces. Just a moment of bad luck. Great drapes. It's too bad you couldn't save the broken mirror and sell it:( Oh well! Love the curtains, so stylish. Why haven't I heard of these target coupons? Where do I get me some? I'm so glad the Messy Business blog brought us virtually together! :) I love your blog and am excited to have a blog to follow that understands things like 110 degree average days (UGH). Eek...sorry to hear about your hand! 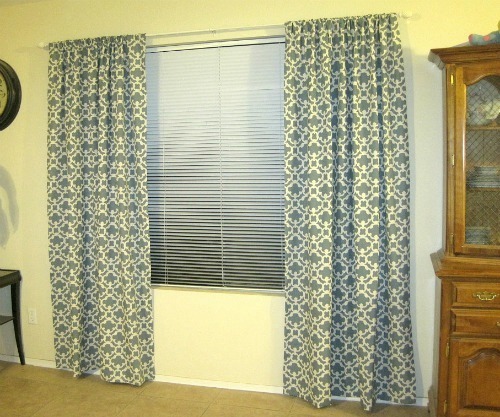 The pattern on your curtains is awesome at least...and score for $10 off! Aaaahhhh I love them even more now that I see them hung on the wall!!!! They look soooo good!!!! I can see why you called it a painful process- lol. Glad to know I'm not the only one who gets a little skittish about Craigslist! (or who puts stuff off forever- my wedding dress that I posted about craigslisting is STILL hanging in my basement.) But anyways back to the curtains- they look absolutely gorgeous and I'm gonna post about them tomorrow! Thanks so much for linking to me; you're so sweet!! Gaaaa I love those curtains!!! It's up! :) love love love the curtains! !